Never before in New Orleans’ history has this amazing selection of Steinway and Steinway-designed pianos been available. 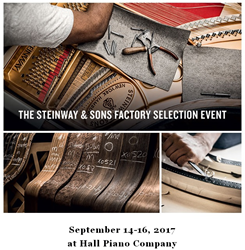 Brought in specifically for this event by Hall Piano Company, Louisiana’s Premier Steinway dealer, customers can select from an impressive array including every Steinway make and model, as well as Steinway-designed Boston and Essex pianos in every price range. The event is 3 days only, September 14-16th at Hall Piano Company, 901 David Drive in Metairie. An opportunity to own the best for less, special “12 Months Same as Cash” terms are available on many models for this event including new grand and upright Steinway and Sons pianos and Steinway-designed Boston and Essex pianos. Another very popular option is upgrading with a digital player system. A feature of this event is the new Steinway & Sons Spirio, the world’s finest high resolution player piano. A masterpiece of artistry and engineering, Spirio enables you to enjoy performances by great pianists — played with such nuance, power and passion that it is utterly indistinguishable from a live performance. Spirio faithfully recreates every intention of the artist with astonishing accuracy, providing the purest connection between performer and audience. Kinchen says, “This event is a rare opportunity to find the piano of your dreams… to select from a quantity and quality of Steinway & Sons pianos truly commensurate with a selection experience at the Steinway New York Factory.” Each Steinway piano is built by hand to the most exacting standards of quality and craftsmanship. And each offers you the unparalleled touch and tone that have made Steinway the standard by which all other pianos are judged. Hall Piano’s services include piano sales and rentals, acoustic and digital piano sales, digital player upgrades, piano moving, repairs, piano lessons and method books.